Autumn already!! Time flies when you’re having fun. Hopefully everyone out there had a great festive and holiday season and no doubt are back into the swing of things. After some much needed time off all the staff at IEC are back on deck. 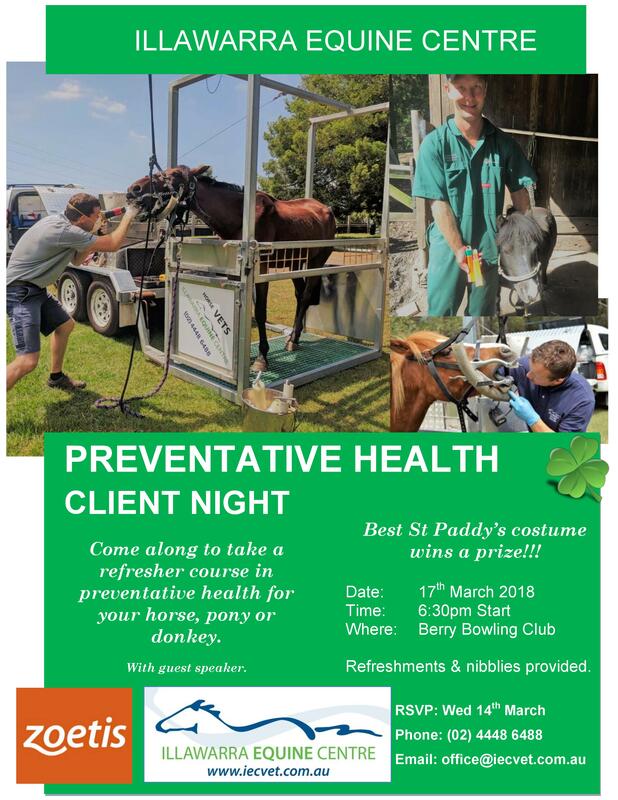 As some of you may already be aware we are hosting a client information night on the 17th of March at the Berry Bowling Club on preventative medicine in the horse. This is an area that is becoming more important as the average age of the horse increases throughout the world. Nicole King from Zoetis will be discussing vaccinating and worming and Dr Mitchell Brown will be discussing Equine Dentistry. If you have any questions about Hendra virus, tetanus, strangles, worming or dentistry (or anything else for that matter) come along for a chat. For all those wanting to attend please RSVP to Lisa in the office on 4448 6488. As it will be St Patrick’s day, there will be prizes for best dressed. Get creative!! Details below. NEW PRODUCT: Electrolene Paste 90 gm (normally 60 gm). Designed to improve your horses recovery post exercise. Currently in stock. At Illawarra Equine Centre we believe keeping our vets informed and educated on the most recent advances in Equine Veterinary Medicine and Surgery is very important in order to provide the best service possible. This year Dr Simon McPhee, Dr Mike O’Brien and Dr Mitchell Brown will be attending conferences and workshops throughout Australia in order to continue to advance their veterinary knowledge. In exciting news Randwick Equine Centre will be moving to Horsley Park, adjacent to the Sydney International Equestrian Centre. The proposed opening date is January 2020. The facilities will be world class. 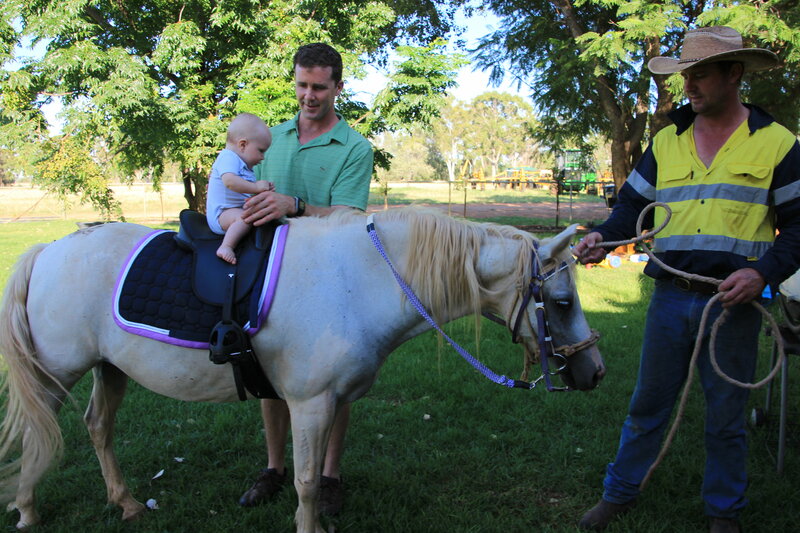 On Mitch’s recent holiday they visited family near Goondiwindi, QLD, Gus had his first ‘ride’ on a pony. Maybe next time he’ll be a little closer to reaching the reins. ← Happy holidays from the IEC team!